Baton Rouge, LA – August 29, 2016 – Lamar Advertising Company (Nasdaq: LAMR), a leading owner and operator of outdoor advertising and logo sign displays, announces that its board of directors has declared a quarterly cash dividend of $0.76 per share payable on September 30, 2016 to stockholders of record of Lamar’s Class A common stock and Class B common stock on September 16, 2016. Lamar expects aggregate quarterly distributions to stockholders in 2016 will total $3.02 per common share, including the dividend payable on September 30, 2016 and the aggregate of $1.50 of dividends previously paid on March 31, 2016 and June 30, 2016. Brands aren't waiting for Pokémon Go to activate its promised in-game advertising, not when the craze is white-hot today -- and could burn out tomorrow. 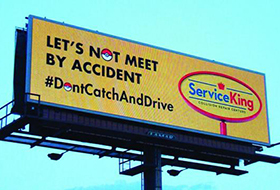 The Service King chain of auto repair centers quickly adapted digital billboards across the country last week to tap into Pokémon Go.